Glass Cutter with carbide wheel. 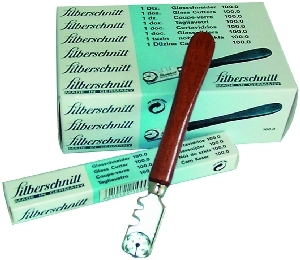 Glass Cutter Wooden handle, replaceable, tempered turret with carbide wheel ø 5 mm. Glass Cutter Wooden handle, replaceable, tempered turret with carbide wheel ø 5 mm, especially selected carbide metal guarantees high wear-resistance, especially suitable for thick or hard glass, straight edge stand-off distance 2.5 mm.